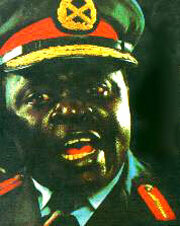 Idi Amin: Good Example of Pelenegrid? 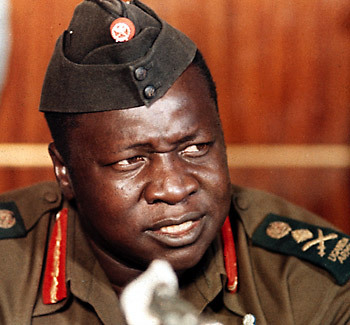 Thread: Idi Amin: Good Example of Pelenegrid? Hmmm... quite a Palaenegrid fellow, I'd say. It can be hard to tell with Negroids because they're a blend of races. I don't think there's a strong division between Palaenegrids, Bantids and Negrids. According to one dendrogram, the Haya, who Biasutti's map suggests are Bantid or Caffrid, are related to Paleonegrid populations. The Bantid type mignt not exist, because other Bantus werent found to be closest to the Haya. What do you mean by 'paleonegrid' ? IMO, Negroids such as Idi Amin aren't any more ancient than Caucasoids. This 'gorilla-like look of theirs might be just an adaptation to living conditions in near-equatorial western Africa. The Palaenegrid or Sylvestrid is a type of Negroid, which is supposed to be more archaic than the Negrids or the Nilotids or the Bantids. Last edited by morfrain_encilgar; Saturday, August 28th, 2004 at 03:41 AM. The only slightly reduced survivors of the Broken-Hill--Cape Flats line? That is how I suspect Satan looks like. Was Amin an especially large exemplar of the Paleanegrid subrace, or are all paleanegrids this big? (Im asking because Ive met negrids with very similar headshape, but much smaller, from Western Afriva, and Im curious if they are related).